Powys, V. (2004). Breeding biology of the Red-capped Robin Petroica goodenovii in Capertee Valley, New South Wales. Corella 28: 4-10. 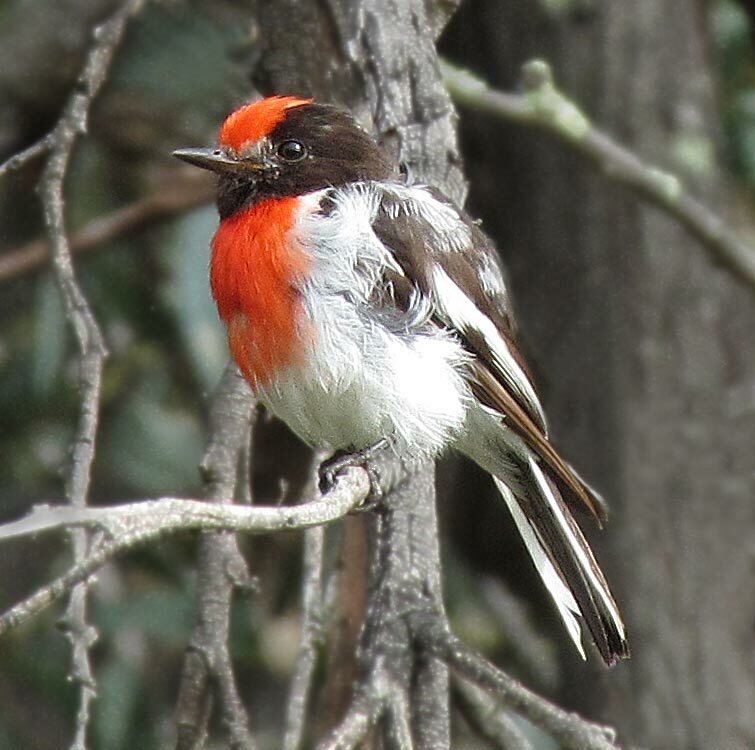 This paper describes the breeding biology for 12 nesting pairs of Red-capped Robins Petroica goodenovii that were studied in 12 hectares of dry woodland in Capertee Valley, New South Wales, from September 2000 to March 2001. Individuals were reliably identified by plumage, song and territory. Twenty-nine nesting attempts by 12 pairs produced 12 fledglings from seven nests (24% nest success rate). Territory size averaged 1.02 hectares, with nests 35-170 metres apart, mean height above ground 4.5 metres. Nests took 2-5 days to build. Incubation began 2-4 days after the nest was completed. The incubation period was approximately 13-14 days; young fledged 13-14 days after hatching and were independent 33-40 days after fledging (aged 6-8 weeks). Nestlings were fed on average 5.5 times per hour over 14 days (n = 24 hours). Powys, V. (2004). Breeding behaviour, vocalizations and plumage of the Red-capped Robin Petroica goodenovii in Capertee Valley, New South Wales. Corella 28: 11-19. 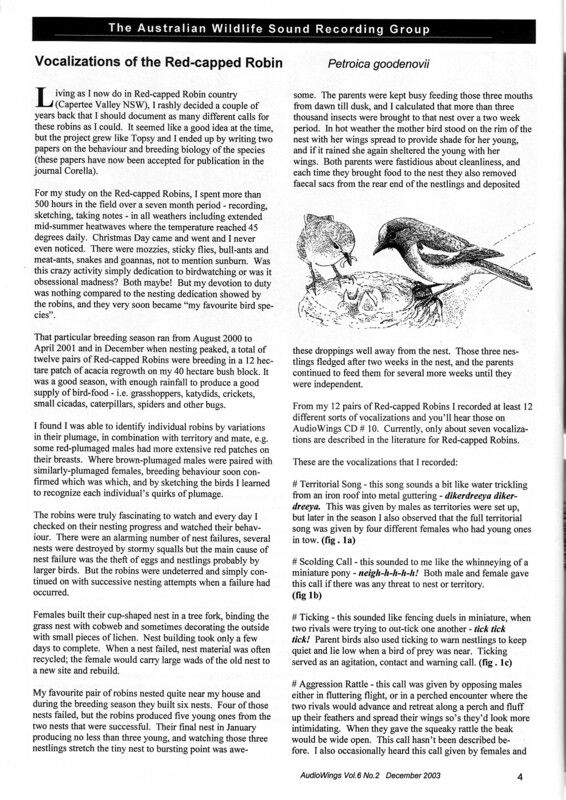 This paper describes the nesting behaviour, vocalizations and plumage of 12 pairs of Red-capped Robins Petroica goodenovii studied during the breeding season from September 2000 to March 2001 in 12 hectares of dry woodland in Capertee Valley, New South Wales. Individuals were reliably identified by plumage, song and territory. Four brown-plumaged breeding males had rust-coloured caps. Fourteen distinct vocalizations were recognized (11 for adults, three for young). 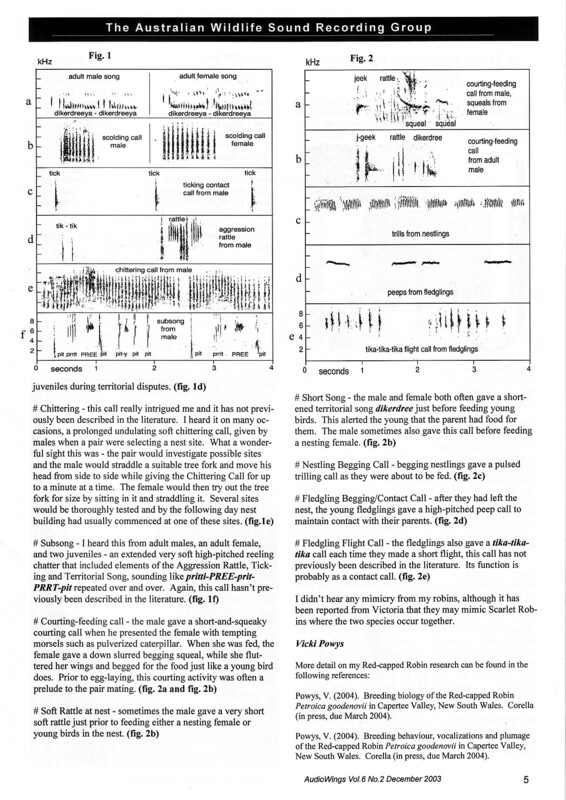 … published in Audiowings, the journal of the Australian Wildlife Sound Recording Group, Volume 6 Number 2, December 2003. Sounds are included at the end of the article. You can also download a pdf of this article here (1.4 mb). Introduced medley of Red-capped Robin vocalisations, in the same order as the sonograms. This page was created in 2012 and upgraded 3 June 2017.